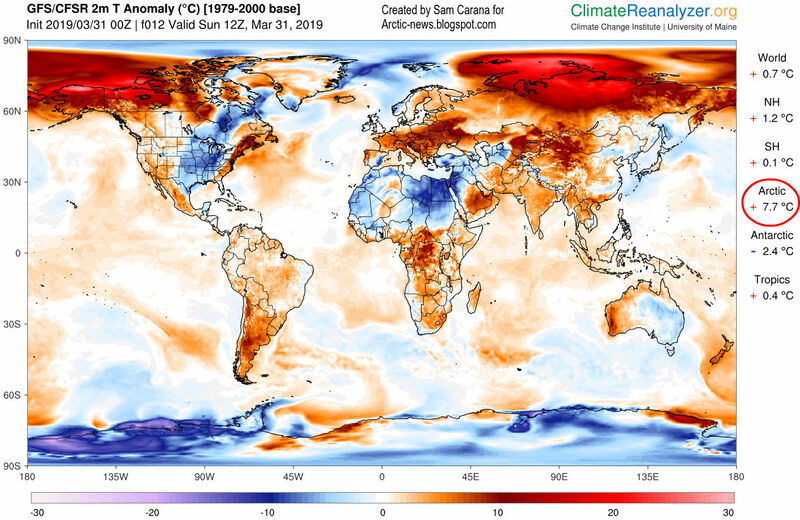 The March 2019 temperature is in line with an earlier analysis that 2019 could be 1.85°C warmer than preindustrial and that a rapid temperature rise could take place soon, as illustrated by the image below. 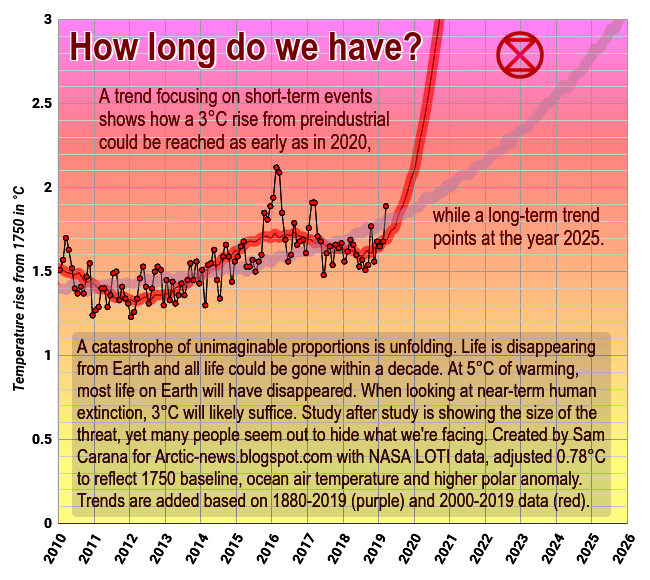 The chart below shows elements contributing to the warming, adding up to a rise of as much as 18°C by 2026. 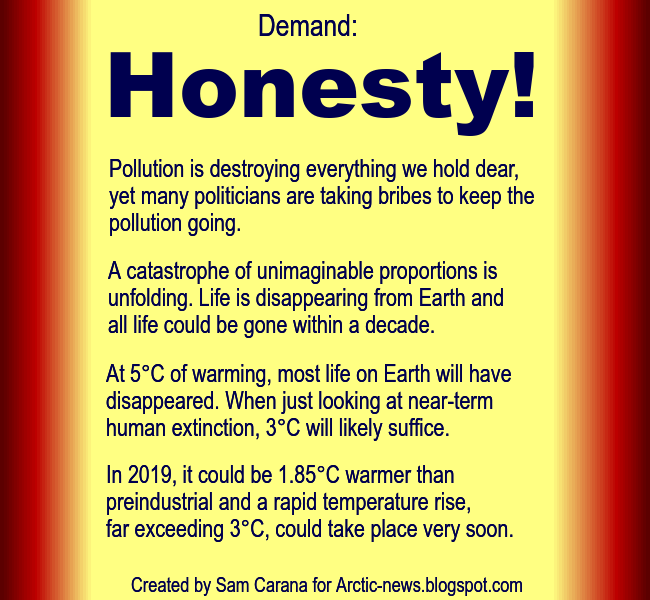 • A rise of 18°C or 32.4°F by 2026? Temperatures in Colorado that day were as low as -13.5°C or 7.6°F, as illustrated by above image. 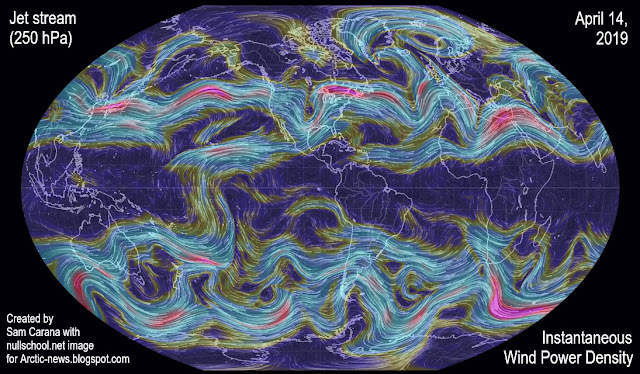 The map below shows the jet streams stretched out from North Pole to South Pole, while the jet stream is also crossing the Equator over the Pacific Ocean. 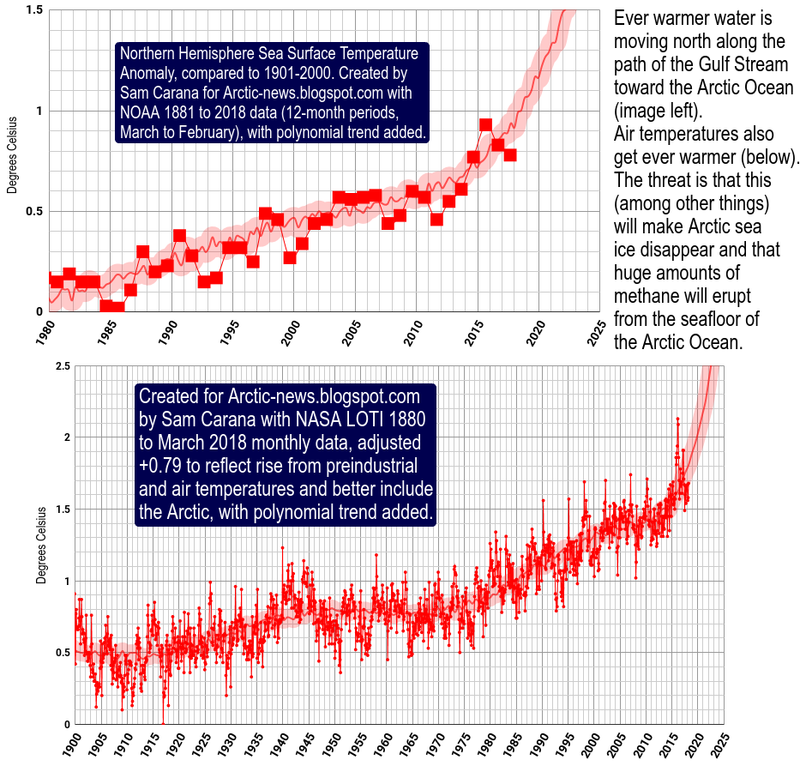 Meanwhile, Arctic sea ice extent remains at a record low for the measurements at ads.nipr.ac.jp for the time of year. As the image below shows, Arctic sea ice extent was 12.9 million km² on April 14, 2019. 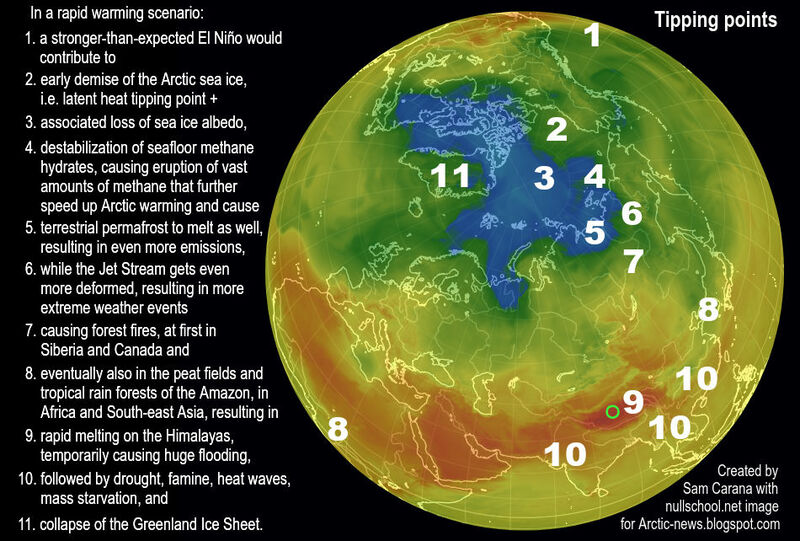 A Blue Ocean Event looks set to occur in the Arctic when there will be virtually no sea ice left. 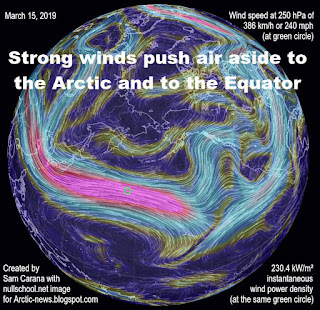 At first, the duration of this event will be a few weeks in September, but as more heat accumulates in the Arctic, the event will last longer each year thereafter. Indeed, a Blue Ocean Event will come with accumulation of more heat, due to loss of latent heat, as a dark (blue) ocean absorbs more sunlight than the reflective ice, etc. Consequences will extend far beyond the Arctic, as shown on the image below that features Dave Borlace's Blue Ocean Top Ten Consequences. 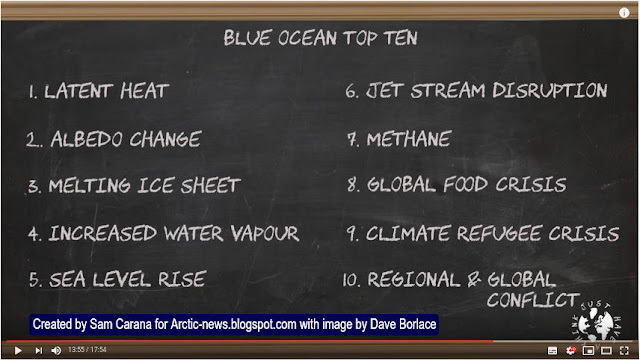 Dave Borlace goes into more detail regarding these consequences in the video Blue Ocean Event : Game Over? A Blue Ocean Event could happen as early as September 2019. 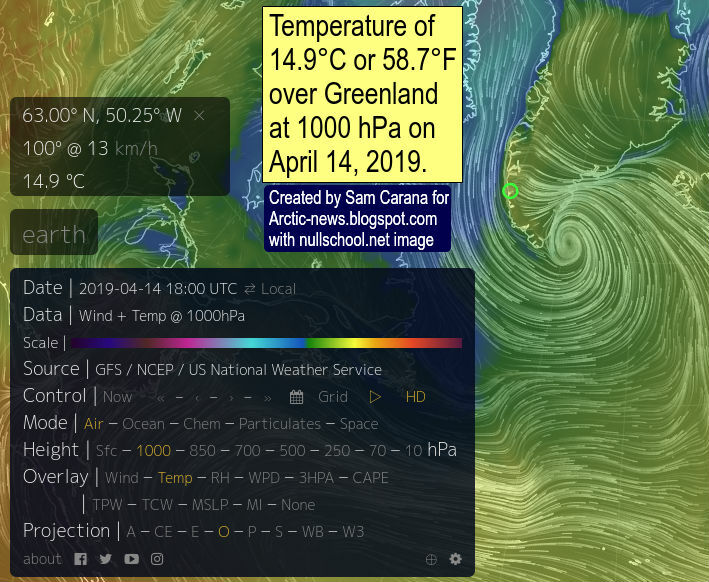 The image below shows that Arctic sea ice extent on April 7, 2019, was 12.97 million km², a record low for measurements at ads.nipr.ac.jp for the time of year. By comparison, on May 28, 1985, extent was larger (13.05 million km²) while it was 51 days later in the year. 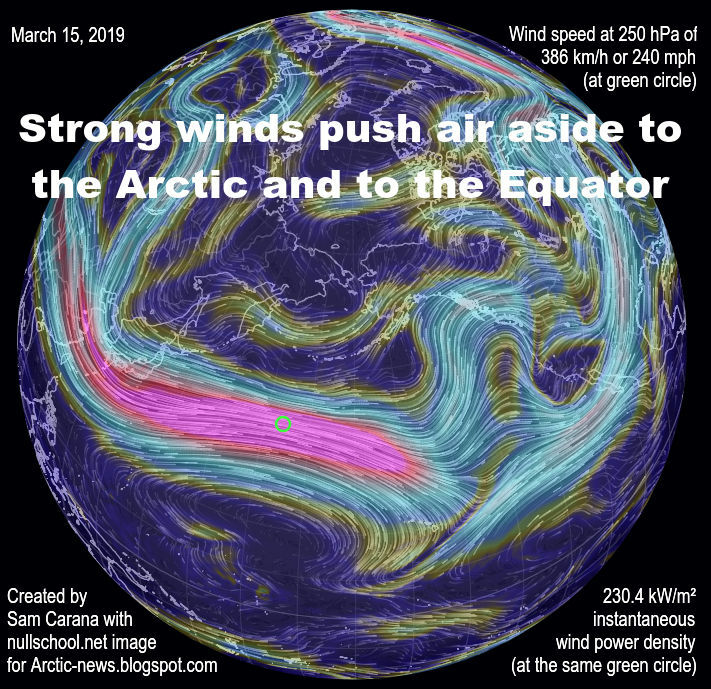 In the video below, Paul Beckwith also discusses the rapid decline of the sea ice and the consequences. Importantly, depicted above is only one scenario out of many. Things may eventuate in different order and occur simultaneously, i.e. instead of one domino tipping over the next one sequentially, many events reinforcing each other. 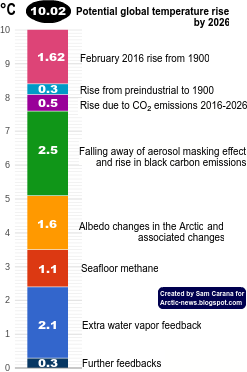 Further points should be added to the list, such as falling away of sulfate cooling due to economic changes, ocean stratification and stronger storms that can push large amounts of warm salty water into the Arctic Ocean. Global sea ice extent is also at a record low for the time of year. 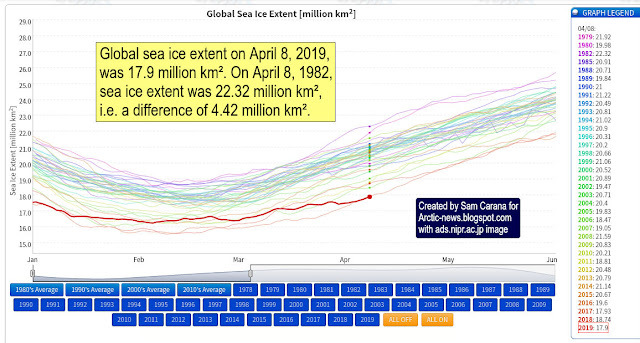 Global sea ice extent on April 8, 2019, was 17.9 million km². On April 8, 1982, global sea ice extent was 22.32 million km², i.e. 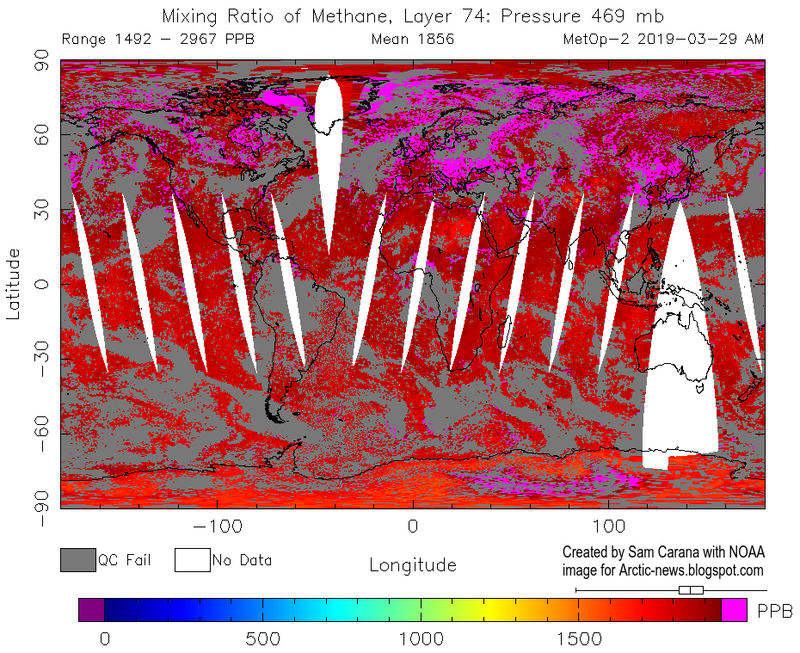 a difference of 4.42 million km². That constitutes a huge albedo loss. 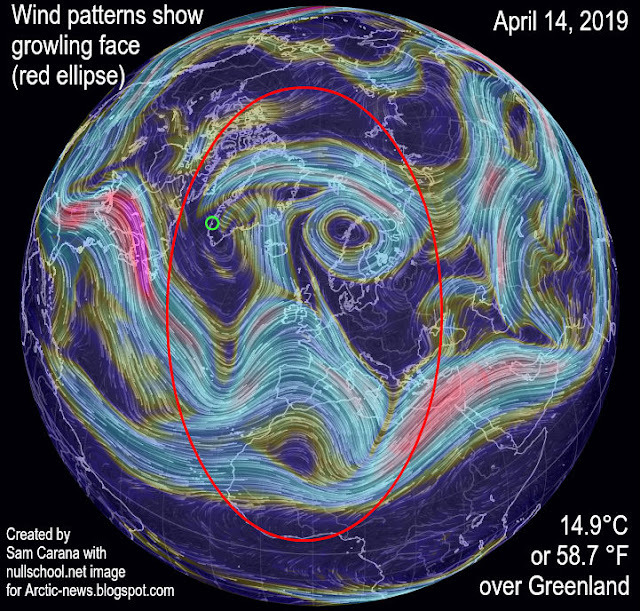 As discussed in an earlier post, this all adds up to further global warming that may eventuate very rapidly. The image below shows how a total rise of 18°C or 32.4°F from preindustrial could eventuate by 2026.